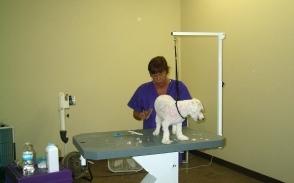 Our professional Groomers have years of experience and love working with dogs. 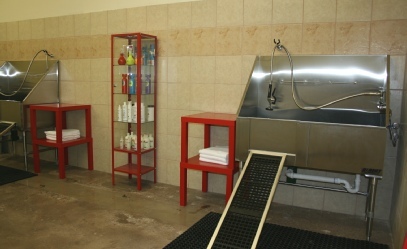 K9 Kampus has a beautiful spacious grooming facility that is also cage free! Our daycare patrons that have been temperament tested are allowed to walk around freely in the grooming facility while they wait their turn. 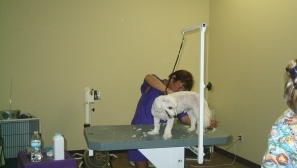 We provide a loving and caring environment to alleviate any anxiety while they are in our grooming facility. Please note that to use our grooming services you must show proof of vaccinations to enter the facility. Rabies, Bordetella and DHLPP are required. We’ve thought of everything at K9 Kampus! To give you more options we’ve installed 2 beautiful professional grooming tubs fully equipped with ramps, easy access doors and pedestals. Now you have the option of using our professional grooming service or for $15.00 . We supply the tub, water, shampoo and towels where you can wash your dog at our place instead of yours! you can get ours dirty instead! K9 Kampus prices, policies and procedures are subject to change at any time. We do our best to keep this site updated, but information and prices are subject to change. Please call K9 Kampus at 321-622-8971 for the most up to date information.